Dust-jacket of the first edition. Foundation is a science fiction novel by American writer Isaac Asimov. It is the first published in his Foundation Trilogy (later expanded into the Foundation Series). Foundation is a cycle of five interrelated short stories, first published as a single book by Gnome Press in 1951. Collectively they tell the early story of the Foundation, an institute founded by psychohistorian Hari Seldon to preserve the best of galactic civilization after the collapse of the Galactic Empire. Four of the five stories had been earlier published in Astounding Science Fiction between 1942 and 1944 under different titles. A fifth part, the first in terms of fictional chronology, was added for the 1951 Gnome Press edition. The original four stories also appeared in 1955 as part of Ace Double's novel series as D-110 under the title The 1,000-Year Plan. Two further books, each consisting of two novellas, were published shortly after and the three are considered a trilogy. Asimov would write two further sequel novels and two prequels. Later writers have written new additions authorized by Asimov's estate. The Foundation Series is often regarded as one of Isaac Asimov's best works, alongside his Robot series. On 1 August 1941 Isaac Asimov proposed to John W. Campbell of Astounding Science Fiction that he write a short story set in a slowly declining Galactic Empire, based on the fall of the Roman Empire. Campbell liked the idea, and by the end of a two-hour meeting Asimov planned to write a series of stories depicting the fall of the first Galactic Empire and the rise of the second. 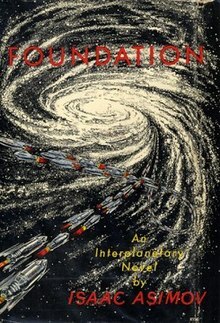 Asimov submitted the first "Foundation" story on 8 September, Campbell purchased it on 15 September, and Astounding published it in May 1942. Asimov wrote seven more stories over eight years, and they were collected into The Foundation Trilogy. Published from 1951 to 1953, the three books became Asimov's most popular science fiction and won a Hugo Award for Best All-Time Series in 1966. This part is original to the 1951 book version and takes place in 0 F.E. ("Foundation Era"). The story begins on Trantor, the capital of the 12,000-year-old Galactic Empire, a powerful but slowly decaying empire. Hari Seldon, a mathematician and psychologist, has developed psychohistory, a new field of science and psychology that equates all possibilities in large societies to mathematics, allowing for the prediction of future events. By means of psychohistory, Seldon has discovered the declining nature of the Empire, angering the aristocratic members of the Committee of Public Safety, the de facto rulers of the Empire. The Committee considers Seldon's views and statements treasonous, and he is arrested along with young mathematician Gaal Dornick, who has arrived on Trantor to meet Seldon. Seldon is tried by the Committee and defends his beliefs, explaining his theories and predictions, including his belief that the Empire will collapse in 500 years and enter a 30,000-year dark age, to the Committee's members. He informs the Committee that an alternative to this future is attainable, and explains to them that creating a compendium of all human knowledge, the Encyclopedia Galactica, would not avert the inevitable fall of the Empire but would reduce the dark age to one millennium. The skeptical Committee, not wanting to make Seldon a martyr, offers him exile to a remote world, Terminus, with others who could help him create the Encyclopedia. He accepts their offer, prepares for the departure of the "Encyclopedists" and receives an imperial decree officially acknowledging his actions. "The Encyclopedists" was originally published in the May, 1942 issue of Astounding Science-Fiction under the title of "Foundation". The story begins in 50 F.E. on Terminus, which has almost no mineral resources. There is one region suitable for the development of a large city, named Terminus City. The colony of professionals, devoted to the creation of the Encyclopedia Galactica, is managed by the Board of Trustees of the Encyclopedia Galactica Foundation, composed solely of scientists, called the Encyclopedists. The affairs of Terminus City itself are handled by the city's first Mayor, Salvor Hardin, who is a political figurehead and virtually powerless due to the influence of the Board of Trustees. However, Hardin refuses to accept the status quo, which he believes puts Terminus in danger of political exploitation by the four neighboring prefects of the Empire, which have declared independence and severed contact with its capital, Trantor, and are now calling themselves "The Four Kingdoms." Hardin manages to avoid an attempt by the Kingdom of Anacreon to establish military bases on Terminus and to take advantage of their nuclear power, which Terminus retains but which the Four Kingdoms do not. Hardin succeeds in diverting Anacreon from its initial goal and furthers his goal of the establishment of a stable political system on Terminus. Hardin's efforts are still resisted by the Board of Trustees and its chairman, Dr. Lewis Pirenne. To remove this obstacle, Hardin and his chief advisor, Yohan Lee, plan a "coup d'état" designed to remove the Board of Trustees from its politically powerful position on the same day that, in the city's Time Vault, a holographic recording of Hari Seldon is programmed to play. The recording will contain psychohistoric proof of Hardin's success or failure; Hardin realizes that his coup is a great gamble due to the possible case that his beliefs are incompatible with Seldon's original goals. The next day in the Time Vault the holographic video of Hari Seldon in his wheelchair appears. He reveals that the Encyclopedia Galactica is actually a distraction intended to make the colony's creation possible. The true purpose of the Foundation is to form one nucleus of a Second Galactic Empire and shorten the predicted period of chaos to a mere thousand years, rather than thirty thousand years. After the video ends, the Encyclopedists admit, to Hardin, to having been wrong, and Pirenne schedules a meeting to discuss their next action. Hardin knew that this victory would give him the leverage he needed to gain significant power and thus "assume actual government" by removing the "figurehead" status from his Mayoral office. He also knew that Anacreon's forces would be arriving soon to forcibly take the Foundation. Salvor Hardin had guessed the solution, and as Hari Seldon said, "it was obvious." "The Mayors" was originally published in the June 1942 issue of Astounding Science-Fiction as "Bridle and Saddle" (referring to Aesop's fable "The Horse that Lost its Liberty", a variant of which is recited by Hardin during the climax of the story). By 80 F.E., the Foundation's scientific understanding has given it significant leverage over the Four Kingdoms, though it is still isolated from the Galactic Empire. Exercising its control over the region through an artificial religion, Scientism, the Foundation shares its technology with the Four Kingdoms while referring to it as religious truth. Maintenance technicians comprise Scientism's priesthood, trained on Terminus. A majority of the priests themselves are unaware of the true importance of their "religion," referring to advanced technology as "holy" artifacts and tools. The religion is not suppressed by the secular elite of the Four Kingdoms, reminiscent of Western European rulers of the early medieval period, who use it to consolidate their power over the zealous populaces. Salvor Hardin, as Mayor of Terminus City, is the effective ruler of the Foundation, and has been reelected as mayor continuously since his political victory over the Encyclopedia Galactica Board of Trustees. However, his influence is suddenly checked by a new political movement led by city councillor Sef Sermak, which encourages direct action against the Four Kingdoms and a cessation of the scientific proselytizing encouraged by Hardin's administration. The movement, which calls itself "The Actionist Party" and whose followers refer to themselves as Actionists, is wildly popular, and Sermak and his fellow Actionist leaders refuse to respond to Hardin's efforts to appease them. The kingdom that is most concerning to the Actionists is that of Anacreon, ruled by Prince Regent Wienis and his nephew, the teenaged King Lepold I. Wienis plans to overthrow the Foundation's power by launching a direct military assault against Terminus, making use of an abandoned Imperial space cruiser redesigned by Foundation experts to fit the needs of the elite Anacreonian navy. However, Hardin orders several secret technological devices, the most important of which proves to be an ultrawave relay, to be incorporated into the ship's design prior to its completion. Wienis plans to launch his offensive on the night of his nephew's coronation as king and sole ruler of Anacreon. Hardin attends the coronation ceremony and is arrested, but he has already arranged with Anacreonian High Priest Poly Verisof, who is aware of the true nature of Scientism and is also Terminus's Ambassador to Anacreon, to foster a popular uprising against Wienis. Convincing the Anacreonian populace that an assault against the Foundation and Terminus is blasphemous, Verisof leads an infuriated mob to the royal palace and surrounds it, demanding Hardin's release. Meanwhile, under the leadership of its priest-attendant, Theo Aporat, the crew of the space cruiser mutinies against its commander, Admiral Prince Lefkin, Wienis's son. Lefkin confronts the mutineers and, captured, is forced to broadcast a message to Anacreon demanding Wienis's arrest and threatening a bombardment of the royal palace if that and other demands are not met. Wienis, maddened by his failure, orders Hardin's execution, but his royal guardsmen refuse to obey him. Attempting and failing, due to a protective energy field, to kill Hardin personally, Wienis commits suicide. Hardin is proven correct again upon his return to Terminus City by another Seldon recording, set to play at this date. Though Actionists continue to hold a significant amount of power, enough now to control the City Council, an attempt to impeach the Mayor has already failed, and his popularity is renewed among the city's residents. It is also confirmed by Hari Seldon that the Foundation's immediate neighbors, the Four Kingdoms, will now be virtually powerless and incapable of resisting Scientism's advance. "The Traders" was originally published in the October 1944 issue of Astounding Science-Fiction as "The Wedge". Circa 135 F.E., the Foundation has expanded and has sent out officially sanctioned Traders to exchange technology with neighboring planets for what amounts to greater political and economic power. Master Trader Eskel Gorov, also an agent of the Foundation government, has travelled to the worlds of Askone, where he hopes to trade atomics. Gorov, however, is met with resistance by Askone's governing Elders due to traditional taboos that effectively ban advanced technology. Gorov is imprisoned and sentenced to death; the Elders refuse Foundation requests for clemency. Trader Linmar Ponyets is ordered by the Foundation to try to negotiate with the Elders, and travels to the central Askonian planet. Ponyets meets with the Elders' Grand Master and deduces that, though he is determined to have Gorov executed, he may be willing to exchange the captive for a suitable bribe, which Ponyets realizes would be a sum of gold. Ponyets clumsily fashions a transmuter that will convert iron into gold. The Grand Master informs Ponyets that others who have attempted this have failed and have been punished with execution for both their attempt and for their failure; Ponyets succeeds and convinces the Grand Master that the gold is appropriate for Askonian religious decoration, which pleases the Elders. Councilor Pherl, the Grand Master's protégé, appears to be wary of Ponyets. Meeting with the Councilor, Ponyets discovers that Pherl is instead quite willing to work with him, if only due to the chances of eventually attaining the Grand Mastership himself. Pherl, from a different ethnic background than traditional Grand Masters and a young man, believes that a stable supply of gold will be able to dramatically increase his power, and Ponyets sells him the transmuter. He also plants a video recorder inside, and, once Pherl tries to back out of paying the agreed price, blackmails him with a recording of the transmuter's use. Gorov is released quickly. According to a new agreement, him and Ponyets can take as much tin from Pherl's mines as they can carry. Ponyets discusses his success with Gorov, and explains that now, Pherl is going to become the new Grand Master - and one very much interested in selling Foundation goods, since Ponyets left all his cargo with him, and making people buy it is the only way for Pherl to salvage some of his pride. Gorov criticizes his techniques due to what he perceives as Ponyets's lack of morality. Ponyets replies by reminding Gorov of an alleged statement made by Salvor Hardin: "Never let your sense of morals prevent you from doing what is right!" Circa 155 F.E., the powerful Foundation, has subjugated the neighboring Four Kingdoms and tries expanding its religious empire. However, due to rumors of the subjugation of the Four Kingdoms and, later, Askone, further expansion faces heavy resistance. Recently, three Foundation vessels have vanished near the planets of the Republic of Korell, thus the nation is suspected of either independent technological development or buying smuggled Foundation goods. Master Trader Hober Mallow is assigned to deal with Korell and also to investigate their technological developments and find the missing ships. Those who have assigned this mission to Mallow, Foreign Secretary Publis Manlio and Mayoral Secretary Jorane Sutt, believe that a Seldon Crisis is underway; they fear that domestic tensions caused by the great autonomy given to Traders and shaky foreign relations may give rise to a nuclear conflict involving the Foundation. Sutt and Manlio, wanting to weaken the Traders and suspecting Mallow of being connected to the smugglers, plant an agent, Jaim Twer, who boasts of a lay education, aboard Mallow's ship, the Far Star. After the Far Star lands on Korell, the crew allows a Foundation missionary aboard the ship, in violation of orders Mallow has given that require his permission before anyone boards or leaves the Far Star. Korellian law forbids Foundation missionaries to be on the planet under penalty of death. The crew determines that the Reverend Jord Parma of Anacreon (as he calls himself) had been captured by the Korellians but escaped before being killed. Rev. Parma is injured, apparently mentally confused, and in need of hospitalization. A short time after Parma has been let aboard the ship, an angry mob appears, surrounding the Far Star, and demanding that the missionary be turned over to them as an escaped criminal. This rapid response by the Korellians in what is an extremely remote location arouses Mallow's suspicions: Where did Parma actually escape from? Why was there a mob seemingly already gathered in the middle of nowhere? Suspecting a set-up, rather than fight the mob, Mallow decides to turn the missionary over to them (and to certain death), despite Twer's frantic attempt to intervene. Soon afterwards, Mallow is invited to meet with Korell's authoritarian ruler, Commdor ("First Citizen Of The State") Asper Argo (after several days of failure at securing such a meeting), indicating that Mallow had apparently passed a test by the Korellians by showing respect for their laws. Argo appears friendly and welcomes Foundation technological gifts; however, he refuses to allow Foundation missionaries on Korell, which turns out to coincide with Mallow's own interests. Mallow, among other things, offers the Commdor tools for heavy industry, believing that will allow him to visit a factory, where the advanced technology would be found if Korell has it. He sees no signs of it, but does manage to catch a glimpse of the ruler's guards' weapons - atomic handguns bearing the markings of the Galactic Empire, which the Foundation assumes has fallen by this time. Mallow's discoveries lead him to believe that the Empire may be attempting to expand into the Periphery again, and has been providing weapons to client states such as Korell. Leaving the Republic and his ship, he journeys alone to the planet Siwenna, which he believes may be the capital of an Imperial province. He finds Siwenna a desolate and sad place, and meets the now-impoverished former patrician Onum Barr in the latter's isolated mansion, which is slowly crumbling. Barr, a former provincial senator and a leading citizen, had served in the Imperial government on Siwenna during a fairly stable time several decades earlier, before a series of corrupt and ambitious viceroys who each harbored dreams of becoming Emperor. After the previous viceroy rebelled against the Emperor, Barr participated in a revolution that overthrew the viceroy. However, the Imperial fleet also sent to remove the viceroy wanted to conquer a rebellious province even if it was no longer in rebellion, and began a massacre that claimed the lives of all but one of Barr's children. The new viceroy also plans a rebellion, but keeps a backup plan; fleeing into the Periphery and carving out a sizable realm there. He had secured a political alliance with Korell by marrying his daughter to Asper. Mallow manages to tour a Siwennian power plant. He observes that the technicians can only maintain the plants, but cannot repair them. He also notes the nuclear generators are much bigger than those of Terminus. Both mean that the Empire cannot replace the goods Mallow sells to the Commdor. He also realizes that religion cannot make further conquests for the Foundation, but a commercial empire can. Mallow is tried for murder approximately one year after his return to Terminus, due to turning over the Foundation missionary to the mob. However, he is able to produce a recording revealing to the court that the "missionary" was in fact a Korellian secret policeman. Acquitted, Mallow is received with delight by the population of Terminus, which (along with the wealth obtained by trading with Korell) all but ensures him the Mayor's seat in the elections scheduled to take place in the following year. To prepare for the election, Mallow engineers the arrest of Sutt and Manlio, suspecting them (rightly) of intending to engineer a coup with the aid of the Four Kingdoms' religious elements, and eventually takes office. However, he is soon faced with tensions between the Foundation and Korell, which declares war on the Foundation, using its powerful Imperial flotilla to attack Foundation ships. But instead of counterattacking, Mallow takes no action, effectively imposing an embargo on Korell, and waiting until the lack of Foundation goods forces Korell to surrender, which it does. King Lepold I, King of Anacreon. Lem Tarki, Foundation Action Party activist. Levi Norast, Foundation Action Party activist. Prince Lefkin, Wienis's eldest son. Prince Regent Wienis, Prince Regent of Anacreon, uncle of King Lepold I.
Poly Verisof, Foundation ambassador and High Priest on Anacreon. Salvor Hardin, First Mayor of Terminus. Sef Sermak, Terminus City Councilor. Theo Aporat, head priest on Anacreon's flagship Wienis. Yohan Lee, organizer of Salvor Hardin's coup and close confidante of Hardin. Linmar Ponyets, Master Trader, liberates Gorov in exchange for a transmuter. Hober Mallow, Master Trader and first of the Merchant Princes. Publis Manlio, Foreign Secretary of the Foundation. Jorane Sutt, Secretary to the Mayor of the Foundation. Jaim Twer, Foundation agent planted on Mallow's ship. Reviewer Groff Conklin declared Foundation "a book of real intellectual entertainment and adventure." Boucher and McComas, however, found it "competent enough writing and thinking, if on the dull side.". P. Schuyler Miller received the volume favorably, but noted that the "revision and inter-writing" of the component stories was "not quite so successful a job" as Asimov had managed with I, Robot. In July 2012, io9 included the book on its list of "10 Science Fiction Novels You Pretend to Have Read". In 1966 the Foundation trilogy won the prestigious Hugo Award for All-Time Best Series. In 2018 the chapter "The Encyclopedists" won a retrospective 1943 Hugo Award for the Best Short Story of the preceding year. ^ Asimov, Isaac (1972). The early Asimov; or, Eleven years of trying. Garden City NY: Doubleday. pp. 383–387. ^ Hardin, wanting to be a psychological engineer, had studied psychology under Bor Alurin, the only first-class psychologist included in the Foundation's original population, but as Alurin was careful never to teach more than the barest theory, of which Hardin had tired, and as Terminus had no facilities for psychological engineering, Hardin had instead gone into politics. ^ Twer accidentally reveals himself to have, in reality, received a priestly education by proving to be ignorant of the nature of Seldon crises. ^ "Galaxy's 5 Star Shelf," Galaxy Science Fiction, February 1952, p.86. ^ Anders, Charlie Jane (July 10, 2012). "10 Science Fiction Novels You Pretend to Have Read (And Why You Should Actually Read Them)". io9. Retrieved June 5, 2013. Chalker, Jack L.; Mark Owings (1998). The Science-Fantasy Publishers: A Bibliographic History, 1923-1998. Westminster, MD and Baltimore: Mirage Press, Ltd. p. 300. This page was last edited on 18 April 2019, at 22:39 (UTC).